Home > Blog > Dental Veneers vs. Lumineers: Which Is Right For Me? Dental Veneers vs. Lumineers: Which Is Right For Me? Have you always wondered how celebrities have a stunning, bright, and even smile? Have you ever felt unsatisfied after a tooth cleaning with the shades of your smile? 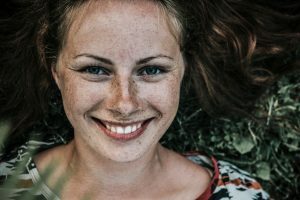 If you’ve always wanted a brighter, whiter smile to help increase your confidence, then veneers or Lumineers may be right for you. The trick is finding out which solution is best for your particular goals. While Lumineers and veneers accomplish mostly the same thing, it’s important to know how they differ so you can make an informed decision. Veneers: How Do They Work? First, a mold is taken of your teeth so that veneers can be built to your exact specifications. Second, the finished veneers are bonded to the outside of your teeth. After shaving down a tiny amount of your enamel, the veneer is bonded to the tooth and is a permanent cover. Veneers are used to cover imperfections on the outside of your teeth, such as grooving, chips, or pits. They also work to strengthen the enamel which protects teeth from acids, dyes, and harmful temperatures. Veneers have the combined advantage of repairing damage as well as improving things cosmetically. Lumineers are also thin, shaped covers that go on the outside of your teeth. They are placed without the need for drilling or anesthetic in most cases. Lumineers also work to cover up markings, damage, or imperfections while brightening your smile. Lumineers also take two visits to apply, because they must be constructed for your teeth. However, you will not need to worry about drilling or complicated installation. The Lumineers are bonded to your teeth easily and are comfortable. If the outside of your teeth have significant damage or if your enamel is very worn down, veneers are probably your best fit. These porcelain covers act like crowns for one side of your tooth and help protect from future damage while helping heal previous imperfections. However, a dentist will not recommend veneers if there is nothing to repair on the tooth. Lumineers are right for those looking to improve the appearance of their teeth or for those who have very minor imperfections to cover up. Additionally, since Lumineers are not bonded to your enamel, they can be taken off later if you or your dentist decides to do so. Either way, these tools help dentists improve the smile of millions of people around the world. Whether you want to help cover up imperfections or brighten your smile for your own sake, Lumineers or veneers could be a great option for you. Schedule an appointment today and see how we can brighten your smile.